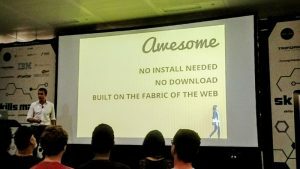 After another favourable month in the meetup calendar, I was again available to get along to the WordPress London meetup, and boy was it a stonker. The meet was held again at City University, who have been incredible venue sponsors of the meetup for ages, and who’ve agreed to keep up the sponsorship deal until the end of January 2018… bloomin’ good folk they are. 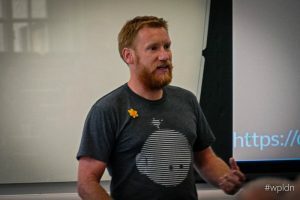 And speaking of sponsors, I should also mentioned that Gary and Dan announced that WP Engine have just agreed to a 12 months sponsorship renewal… so huge thanks to them also, and of course to SiteGround who sponsored the June event too. WordPress London 2017 are after some support in formatting and posting up the transcripts from the talks. If you’re interested then you can find out more by tweeting me. Videos from previous meets are on the WordPress London facebook page. 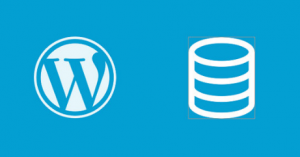 WordPress London have a new section for lightning talks, called wp_update_post… and they’d like talk ideas. If you’re interested, tweet ‘em up. WordCamp Manchester – Maybe the 28th October? This first talk came from Doug, who works for Smarter Digital, and focused on his history with Page Builders, and how his opinion has changed over time, right up to the 2nd-gen page builders of today. He told us how they’ve evolved, from the times of using shortcodes, and widgets, and then ACF. From these building-blocks came, what Doug refers to as, 1st gen page builders. These 1st gen incarnations had a few weak spots. They weren’t great at showing how content was going to be rendered on the front-end, their performance was questionable, and then if you disabled them you were left with what Doug refers to as shortcode hell. These thoughts and anecdotes appeared to ring true with many attendees… there were a lot of burnt fingers. He then talked about Beaver Builder, one of a current raft of plugins that he classes as 2nd gen page builders. This part was thoroughly enlightening… he talked through how he uses it in his workflow, as a developer, and how you can create modules for it, configure it dramatically via its powerful API, and handle user access. Now, I can certainly see myself as one of these devs who instantly feels a bit nauseous when page builders are mentioned, but Doug has done them proud with this talk… go watch it now. This next slot was incredible… Dan and Gary made a real steal in getting hold of this chap to talk through the updates to WordPress that dropped in version 4.8. 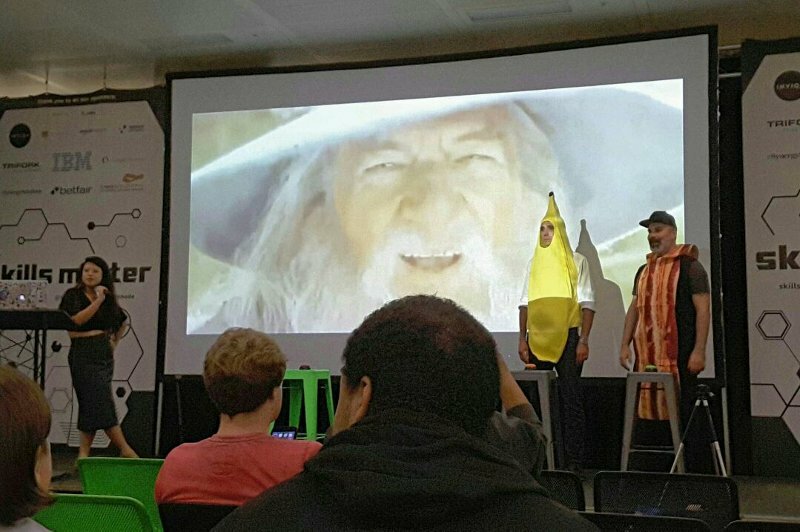 OK, I’m kidding… it was me doing a brief lightning talk as part of the new format of the meetup. I don’t want to big myself up too much, but if you want to know about the new Widgets then checkout the slides, or video of the talk. Next up was Anthony, talking through his pseudo ORM for WordPress, WP_Model, and open source project designed to provide a better method for handling posts using a simple OOP style syntax. 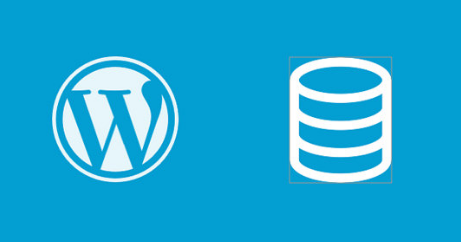 Anthony also mentioned some generic benefits of re-using WordPress as the backend for your project. Things like its popularity and community, and from those the vast repository of plugins. Well what can I say… GO CHECK OUT THE VIDS OR BE SQUARE. Seriously, do it now… Doug and Anthony are aces! And so are Dan, Gary and Annabelle, for organising another great meet. Thanks too to City University, WP Engine and SiteGround, for sponsoring. Next meet is booked in for the 27th July, RSVPs open right now, too. 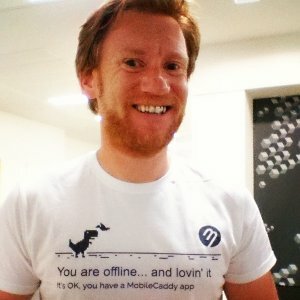 And with this in mind, and the fact the last AngularZone meet was so good, I was more than eager to make sure I went along… and of course it gave me a chance to sport my new MobileCaddy tee, too. Now, I have some thoughts about the meetup and venue as a whole, but for now let’s jump straight into the talks. PWAs are creating a lot of noise at the mo – and rightly so – and Dean “Deano” Hume was here to give us the latest lowdown on them, and talk about how their features can be used in the real world. PWAs are built using an emerging set of web standards, and essentially offer web developers the tools to bring native-esq experiences to web sites and apps. Such capabilities include Push Notifications, Geo-location access and other hardware APIs including bluetooth and NFC. Part of the awesome-sauce that powers PWAs are Service Workers. These are also being pumped highly in the web dev world, and they enable support for many cool enrichments to standard “web sites” as well “web apps” (and no, I don’t know what the difference really is, or even if it’s important). I’ve seen many talks on Service Workers and on the whole they’ve been very good, and normally have covered different uses, approaches, and features. But one thing they all include is a statement like “Nope, sorry, Safari doesn’t support them”. Service Workers provide a dev with the ability to intercept network requests before they leave the browser, and this can be used to provide offline handling, low-data requests and probably plenty of other use cases that haven’t yet been thought of. Speaking of which, Dean covered a scenario using Promise.race in a Service Worker that provided an improved experience for when a third party library failed to load, and meant that the page was able to load much more quickly – very cool. No-connectivity handling – being able to give the user at least some basic information offline. Along with the great demos and info, Dean also supplied an incredible amount of links to online demos and resources… so check out his slides for all the details. Now, I won’t claim to understand what happened next. But it was fun, so I’m just gonna leave this picture here and you can make of it what you will. Following on from this, erm… experience… Tracy and Gerard went on to tell us about ngCruise. This is a new Angular conference with a difference. Yes, you’ve guessed it, it’ll take place on a cruiseship. The website should be launching this week but the plan is for the conference/cruise to commence by bobbing out of Florida in May 2017, and will comprise of a few days of talks, programming and fun. Tracy is hoping it’ll be a few hundred USD per day and should include talks, food and of course accommodation (with a difference). CFPs should open soon. Peter and Gerard gave us a nice little fireside-chat type thing, discussing the upcoming Angular Connect conference (27th/28th Sept). They mentioned how they were updating the format slightly, from last years conf, to try to emphasise some of the more interactive sessions. I can only imagine that the conference is going to be ace… as I’ve once again had to bail on getting a ticket. Closing us off was Uri Goldshtein, who had literally only just flown into London. Uri is part of the Apollo team and was hear to give is an introduction to GraphQL, and although his talk title mentioned Angular, it was mostly a generic intro. This was fine with me as I had virtually no idea about GraphQL, whatsoever. Now I won’t try to come across as a GraphQL expert following the talk, in fact if anything I have more questions now than before… so as well as writing down what I think I grasped from the evening, I’ll also suggest that you take a look at the GraphQL website for yourself. But anyhoo, GraphQL was born out of Facebook, late 2011, at around the time Mark Zuckerburg dissed web tech for mobile, and went all native on us. It is designed to be a “Query language over your existing data”. It can be used to provide a middleware and protect your clients from evolving backend APIs and updates. It’s also type-based, and should allow for absolute understanding between what a client asks for, and what it receives. Part of this middleware behaviour includes splitting single request out to multiple backends, and bundling the responses to each up into a single response for the calling client. This kind of architecture can mean drastically simplified client code… and that’s definitely a good thing in my book. Uri demoed Instagraph, built by Kamil Kisiela, and showed us a very neat GraphQL editor/runner called Graphiql. During the demo Uri spoke about how the use of GraphQL allowed for “optimistic UIs”. This is an approach where UIs update as soon as an action, such as liking an Instagram photo, is invoked, and that actually these changes take place before any round-trip to the server/backend is made. This approach is one that we automatically use at MobileCaddy, though we tend to include this under the Offline First banner, but it’s nice to know this specific UI handling has it’s own name too. Users of GraphQL, other than Facebook obviously, include Pinterest, Github and Shopify. Despite Uri being a really passionate and captivating speaker, I’m not entirely sure I’ve “got” GraphQL yet – I don’t know whether it’s available simply through client side and server side libraries, or what transactional performance overhead, if any, comes into play. I would love the chance to see him and again and have a good chat about it all. With this in mind I think I’ll do some digging into whether or not I could sit GraphQL in front of Salesforce’s SOQL. So why not go out and start playing. In all this was another excellent meetup, and Gerard deserves high praise for organising such great talks and food (burritos) and drink. The inclusion of prize draws (FREE TICKET to ANGULAR CONNECT) is a really good touch. Thanks to go to eSynergySolutions for sponsorship and assistance. Sadly, turn-out was relatively low. I counted less than 50 attendees, which is a shame as well over 100 had RSVP’d “Yes”. I found that there was little chat among attendees, and I also noticed this at the previous meetup. Whether or not it’s due to the size of the venue, or the fact that folk were sitting in the hall before and between talks, rather than around the breakout area, I’m not sure. At other meetups I attend, these “before and after chats” are one of the really valuable and attractive things. Maybe next time the hall can be “closed” whilst talks are not on, and hopefully they’ll be a deliberate post-talks-chat arrangement too? I hadn’t been to any meetups in quite some time, but this inaugural meetup of the new AngularZone community had a lot of draw… Service Workers, D3, prizes, and more. The meetup was organised by Gerard Sans, who has a history of speaking and organising meetups. It was held in the large hall of the Skills Matter CodeNode venue, which is a perfect venue for a meetup of a decent size. As it was the first meetup for AngularZone, Gerard gave us a brief intro to what his view was for it. His idea is that physical meetups will take place once every two months, and have topics on web tech in general, and in particular Angular. He’d like to see talks, and a community, driven by passion. As well as the meetups and obvious greatness of tech talks he would like to see a community contribution program come into affect, where folk (including himself and Todd Motto – that guy gets around, right) can give advice as seasoned speakers and bloggers. It sounds not to far removed from his previous Angular Labs idea, though to be honest I didn’t get involved in that, so this is purely guesswork. Up first was Phil Nash talking us through Service Workers. Now these are not overly new, but still very much in the early days of adoption. If you are new to Service Workers though, you can start by thinking of them an intelligent way to support offline behaviour for your web sites and apps. They’re the successor to the painful-to-understand-implement-manage app cache tech and have been greatly pushed with the current rise of the PWA (Progressive Web App). We were, of course, shown the awesomeness that is the trailer for Service Worker, and I felt sorry for AppCache, so I put one together. I could apologise for the distracting gif, but I won’t, and I still pronounce it Gif, not Jif, deal with it. At the time of wrting, Service Workers are available in the latest builds of Chrome, Firefox and Opera, and are known to be being actively worked on in Edge… and in the words of Phil, “who knows about Safari”. We were shown some demos that Phil had been playing on thath utilised the Twillio API. His demos used various features exposed through Service Workers (offline, notifications, background sync, etc). Service Worker is a very powerful browser feature, and one I hope that will soon be adopted so I can use it in the hybrid apps we’re building at MobileCaddy. One of the key features I see available in Service Workers over AppCache is the ability to programatically blat assets from the cache, and I can not wait to use it and say good ridance to AppCache. Phil’s talk was really interesting and very well presented. His passion and knowledge were obvious. If you’re after his slides, they can be found here. Ændrew is a journalist/data wrangler at the FT and set off to take us through using (the bloomin’ black-magical D3.js) in Angular2 projects. His talk started off with some comments on TypeScript and how having typed languages should catch silly bugs earlier on in a project’s lifecycle (though he also mentioned a blog post that argues that there isn’t any factual proof of this). Something that is hard to argue with about TypeScript though is the benefits of it’s self-documenting characteristic, which can only be a good thing. Even being fairly new to ng2 myself, these points certainly ring true with me. After much config hacking and setup, we finally got around to seeing some D3 code, which by comparison was relatively short and straight-forward – in a “my mind can’t take in any more info” kind of way. I’m not sure if I’ll ever get over how magical D3.js is and how much sorcery their implementors use to bend it into shape, but the output of beautiful data visualisations always blows my mind. Gerard had a few prizes to be won, which is a nice touch for a new meetup, so kudos to him. I even won a year’s JetBrains license… so even better. Talking of free-stuff now’s a good time to thank Gerard for putting on a really interesting meet and to the sponsors (skills matter, eSynergySolutions, poncho8, JetBrains, Google Developers) for covering the venue, food, drinks and prizes. Talks were recorded and should be up on the skills matter site in the near future. It had been over a year since I last attended a WordPress London meetup, and I’m so pleased to be back going along to them again. Last Thursday I trotted along to the City University lecture halls in Angel to get my fill of WordPress community goodness once more. And for what reason did I start going along to these again? Well I have just recently released freemium WordPress plugin, called Turbo Widgets. This is an update to the five star rated Widgets on Pages plugin that I wrote and submitted to the WordPress plugin repo many years ago now. With this now out in the wild I felt that it would be good to get involved in the community again, and make sure that I’m up-to-date with the best practices, technology and, of course, gossip. On my way into town I did the usual “search for the event hashtag to see of anyone is about for a cheeky half beforehand”… and loandbehold this popped up in the results… result! I knew of Jenny from her move to HumanMade and her stunning work in the WordPress community; she was lead organiser of the amazing London WordCamp 2016, so who was I to turn down an invite like that. I had a cracking pint with her and mostly chatted about the recent WordCamp. If you ever get the chance to chat to her then you’ll find her passion something to cherish. Onto the event, and the food and beer that was provided thanks to the evening’s sponsors, SiteGround, WP Engine and Beaver Builder. Some quick, and nice, chats were had and then the talks began. Elliot shared what he’d learnt from taking on his SaaS offering YoGrow. He spoke of the journey from it being a plugin in the WordPress repo right through to it’s current state as a SaaS offering. He first spoke of the downsides of the public repo, and how it’s very hard to get a real valuable insight into the usage of the plugins. He said it was very hard to have a conversation with users, and to find out what features they like etc. He also ran through some reasons to use WordPress as the platform for your SaaS project, and other tips that he’d picked up on his way to his current position. I haven’t found a link to his slides, yet, but he’s what I’d jotted down in my notes. Don’t try to do to much, don’t focus on the solution, and focus on the problem. If you can, market whilst you’re building. Set some KPIs, even if they’re just guesses they’ll keep you focused. I also asked Elliot if he was ever concerned about uptime when he pivoted to a SaaS from a product. This worry is one that is right at the front of my mind when I ever think about setting up service businesses. Elliot was pretty dismissive of this, and said that there were top-notch WordPress hosting companies that took this worry off his shoulders, two potentials are actually sponsors of the meetup too. Mark was next up, and gave us a technical talk on how a WordPress dev/admin could use Docker in their workflow and deployment. He started out explaining that he first started reading about Docker following a hack on one of his sites that quickly spread to his others. By using Docker, Mark is now able to sandbox all of his sites, so that any compromise is now limited in risk. He then gave us demos of Docker in action. He showed us how to get a WordPress site setup, and how the various parts all fit together. To be honest I couldn’t do his talk justice, technically, so I’ll just link to his slides. In my local WordPress dev workflow I currently use Vagrant through the wonderful VVV, whether I’ll switch to Docker for that I’m unsure, but perhaps if I ever take of my own production hosting then maybe I’ll give it another look. I was so pleased to be at another local WordPress meetup, I honestly missed it, and the members, so much. 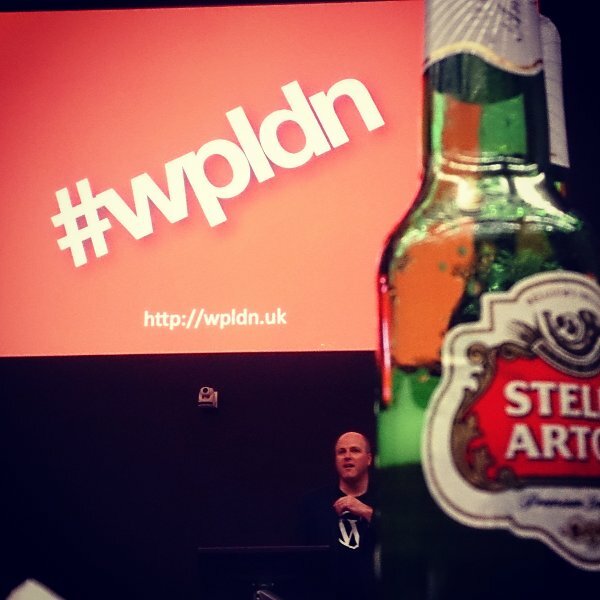 Dan appears to be doing a great job organising the meetups, and the wpldn.uk project (more about that in another post, to come) and deserves a huge thank-you, from at least me, on such a good night. Thanks also to the speakers and let’s not forget the sponsors. The next meet has already been pencilled in for the 26th May (though check meetup for updates, as it may change), so mark it in your diary… and I hope to see you there. Clients from Hell : Educate the good ones, they’ve probably not bought a website before. Fire the bad ones. Business is Personal : If you’re a freelancer, BE a freelance; don’t pretend to be an agency if you’re not. If you do you won’t be authentic, and this will show. Joel also did some shameless pimping of his The Business of Web Design conference, which I have to say has a nice looking line-up of speakers. I’d probably be going if we weren’t due a baby the week before. He also asked for freelancers of all sorts to get in touch with him. Looks like business is good. I have seen one or two of Dave’s talks before at various WordPress (un)conferences and after seeing his take on Baz Luhrmann’s “Everybody’s Free To Wear Sunscreen” I wasn’t sure what to expect next. He didn’t disappoint by starting the talk with some kind of body convulsions which, I think in popular culture, could be described as dance moves. He then proceeded to talk us through some basics behind running a WordPress migration with as few hiccups as possible. He discussed various migration types (server to server, multisite to singlesite, domain swapping) and their various pitfalls. He also talked through a few tools which can make life easier. These included MySQL Workbench and his company’s Search/Replace plugin. In true Coveney style he then plumped for a live demo of a site migration (server to server and domain swap)… the audience, of course, new the perils of live demos and were all waiting for the inevitable. And of course the inevitable happened. So much so infact that Dave’s new database that he was using in the demo ended up being named fuckit. He rode out all that the live demo-gods could throw at him with it finally succeeding. His parting words of advice were “Don’t work with computers”. Stiofan and Tim talked to us about GeoTheme and the move to a new GeoDirectory plugin that will be appearing on WordPress.org very soon. They briefed us on the history and the direction they think the plugin is headed. How they want it to become and extendible product with multiple revenue streams. The plugin looks like it’ll be very powerful and is well worth looking at if you’re interested in building up any kind of location-based directory. The standard post-meetup beers were had in a hipster-filled pub just around the corner, and I had some lovely chats with old friends and new from the WordPress community. I heard from a couple of the guys and gals that there was a lot of work out there for a WordPress freelance dev… this is certainly good news with my resignation notice period winding down. I certainly can’t wait for the next one.